Troop 405 is a Scout-led Troop, founded in 1986. Over 40% of our Scouts attain the Eagle Scout Rank (188 Eagles of the 450 Scouts). Our Scouts have performed lifesaving acts, and have won awards for conservation projects. Our Scouts are members of the National Honor Society, have received National Merit Scholarships, and include accomplished athletes and musicians. Our Scouts have attained OA Vigil Rank, served in the US military, include ordained ministers, and Philmont Scout Ranch employees. Troop 405 Scouts plan the Outdoor Program. Monthly campouts include rock climbing/ rappelling, caving, cycling, hiking, backpacking, snowboarding, water sports, and fishing. Summer camp highlights include Hawaii, Colorado, and Virginia. Troop 405's partnership with Venturing Crew 405 allows our Scouts to attend Philmont Scout Ranch every year. Troop 405 annually sends Scouts to high adventure bases at Philmont, Northern Tier, and Florida/Bahamas Sea Base. 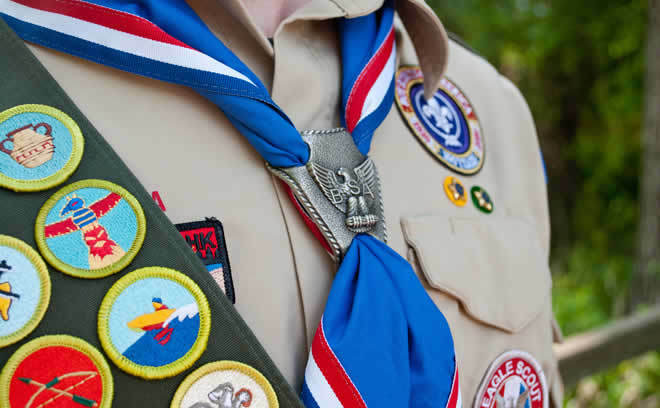 Troop 405 Scouts proudly wear the full Boy Scout Uniform to every meeting and activity.